High demand for last-mile logistics sites and a dearth of supply are driving up rents in south London's industrial market. 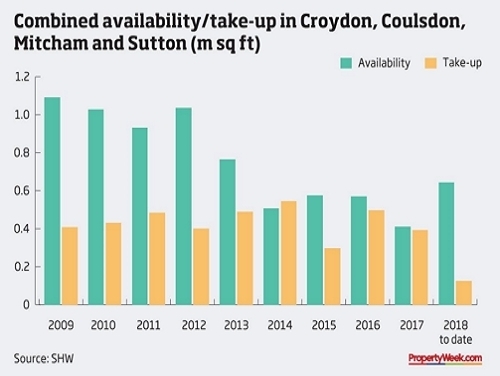 Figures from property advisory firm SHW show that in 2017, take-up in the London boroughs of Croydon, Sutton and Merton totalled 392,000 sq ft, close to the nine-year average of 435,000 sq ft. And in the same year, availability of stock fell to an all-time low of just over 400,000 sq ft.
pushed occupiers out to areas such as Mitcham and Croydon; and there has been no new development of multi-let industrial schemes since 2008," he says. unit to deliver from, the substantial growth in population and the new Westfield/ Hammerson shopping centre and we have the ideal ingredients for a high-rental-growth industrial location!' This is already happening; in some locations, industrial rents have nearly doubled over the past five years. "It is no wonder that most of the main industrial estates are owned by funds and in some cases have been the best performers in this sector," says Gale. "The rumblings of discontent among occupiers and tenants are tangible and if they could move to a lower-cost area they probably would, but availability just doesn't allow for this." Gale cites the Willow Lane Industrial Estate in Mitcham as an example. Some tenants at the south London manufacturing hub are still paying £6 to £7/sq ft but are due a rent review. SHW has recently set a record rent for the area of £14/sq ft for a 6,600 sq ft refurbished unit - if that were to become the norm across the estate, it would have a significant impact on the viability of some of the businesses based there. A few new developments are being planned, including Affinity on Beddington Lane in Croydon, which is rumoured to be under offer to an online grocer, and the redevelopment of 687-689 Mitcham Road, which is under offer in its entirety to another online retailer. However, with Prologis's purchase of 10 acres in Beddington Lane entangled in red tape, it may be a few years yet before this stock-starved market sees any further new-build speculative development.